Brady Deaton, University of Missouri chancellor and professor of Agricultural and Applied Economics in CAFNR, was designated chairman of the Board for International Food and Agriculture Development (BIFAD) by President Barack Obama. BIFAD was created in 1975 under Title XII (Famine Prevention and Freedom from Hunger) of the Foreign Assistance Act. Its mission is to draw on higher education scientific knowledge to advise the country’s international assistance efforts. Deaton came to MU in 1989 as professor and chair in CAFNR’s Agricultural Economics Department. He later served as Social Science Unit leader. He transitioned from faculty to administration in 1993 when he was appointed chief of staff in the Office of the Chancellor. He became deputy chancellor in 1997. 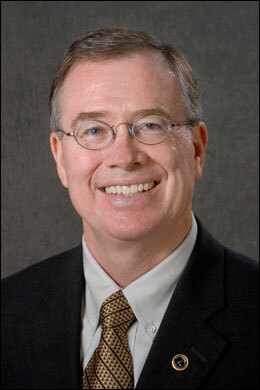 In 1998, Deaton was appointed interim provost and was named to the permanent position in October of that year. He became the executive vice chancellor for academic affairs in 2001 and chancellor in 2004. Deaton has been nationally recognized for his efforts to promote global education and international understanding beginning with his service as a Peace Corps volunteer in Thailand. Recent initiatives include establishment of the European Union Center and MU’s Confucius Center to promote education, trade and cultural exchange between China and Missouri. Deaton serves on the Board of the Association of Public & Land Grant Universities and recently served as chair of its Commission on International Programs, which recognized him in 2006 with theMalone Award for International Leadership. He is vice chair of the Council on Public Higher Education in Missouri and serves on the board of the Donald Danforth Plant Science Center in St. Louis. He has consulted with Winrock International, the Kellogg Foundation, The Southern Growth Policies Board, National Academy of Sciences and the Institute of Food and Agricultural Science at the University of Florida. Deaton was a member of the advisory committee on Small Business and Agriculture of the Federal Reserve Bank of St. Louis, and has addressed legislative committees at the state and federal level. He also led workshops on public finance and university funding strategies in Russia and Estonia following the collapse of the Soviet Union. His work with the International Nutrition Commission Service resulted in a co-authored teachers’ manual for international training programs on food, nutrition and agriculture. Deaton lectured on agricultural trade and rural economic development issues in Japan at the request of the Japan International Agriculture Council. He served in Washington, DC as staff director of the special task force, Food for Peace.